25th Annual Taste of Jefferson is just around the corner it is sponsored by the Marion Co. Chamber of Commerce. Jefferson Texas restaurants will take to the streets again this year to give you a taste of the best they have to offer. You will be delighted to taste dishes from businesses you might not have tried yet. In fact that is a fantastic reason to come. All the businesses set up nice tables all up and down Austin Street one even had a grill and cooked right there on the street. And then there was one restaurant that even had hot fried catfish for the tasting. Even the dining areas were a feast for the eyes. Other local shops set up really appealing areas to sit and enjoy the day. There were yard decorations and willow chairs set up for sitting on, umbrellas to escape the warm sunshine and even a DJ playing lively music during the event. Be sure to plan for this event every year, you won’t be disappointed. If you’re staying at our Jefferson Texas bed and breakfast let us know and we’ll try not to over stuff you at breakfast…Not making any promises but we’ll try because we really think you should at least try some of the great food Jefferson has to offer. 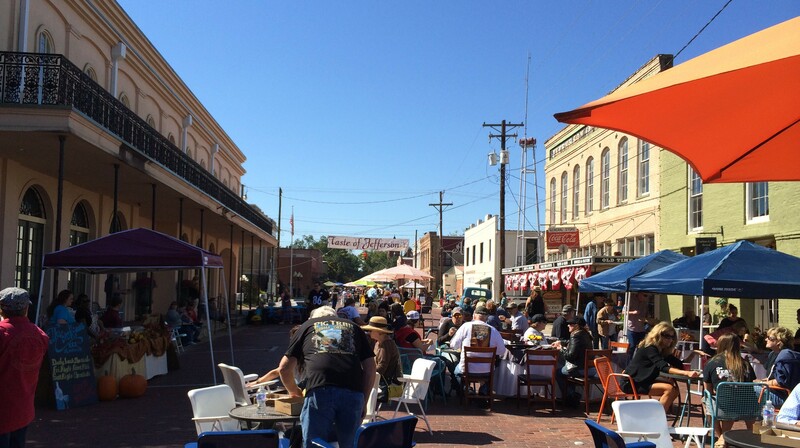 Come to Jefferson Texas for a real small town fall weekend, there’s always something going on around town. This entry was posted in Dining, Fall Events by Tammy D. Bookmark the permalink.